S I G N & D I G I T A L G R A P H I C S • August 2018 • 39 Conclusion We now have multiple choices for printing onto rigid sub- strates. Selection of the best technology is application depen- dent. 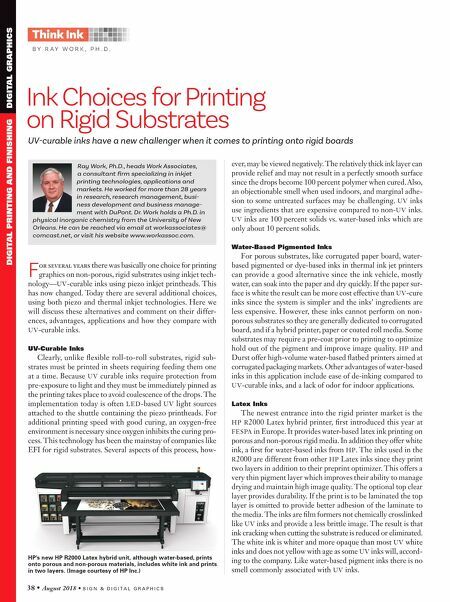 LED UV ink technology has been the only choice for non-porous rigid media until now. The introduction by HP of a latex printer into this application offers a choice and some very attractive performance characteristics. Even though HP offers all three technology options in their product line I expect them to continue promoting Latex technology further into nearly all applications since it offers a low cost, greener, safer alternative to LED UV technology. SDG The water-based inks in the Durst Delta WT 250 printer employs Durst's patented Water Technology, and the printer is well-suited for a range of corrugated pack- aging and display applications. (Image courtesy of Durst Image Technology US) EFI's HS125 Pro is an LED-UV printer that is very efficient at printing onto rigid substrates with print speeds of up to 4,500 square feet an hour. 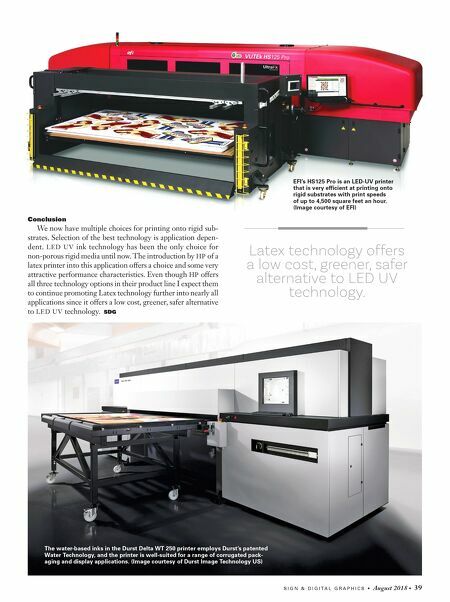 (Image courtesy of EFI) Latex technology offers a low cost, greener, safer alternative to LED UV technology.